For general discussion of polyhedra, not necessarily Stella-specific. I've been using Great Stella for a few years now, slowly building a collection of polyhedra. 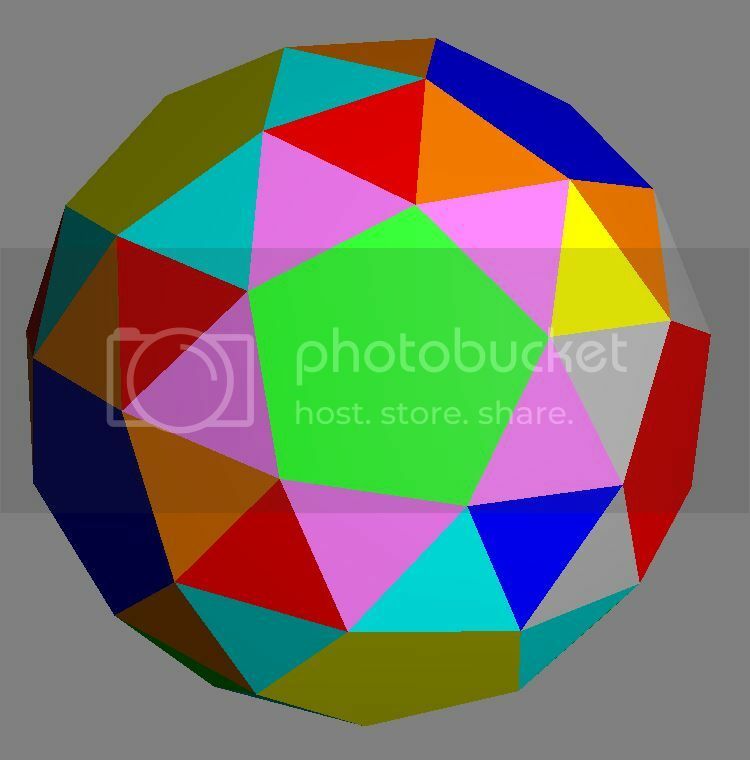 I'm on the last of the Archimedean solids, the snub dodecahedron. I'm OCD about coloring scheme, so I have a specific desire to color it a certain way. My strategy is to use the 4-color dodecahedron scheme for the pentagons (red, green, blue and yellow, for example). That leaves the triangles. Each set of three adjacent pentagons shares one triangle. So that one gets colored the primary color not used on the adjacent pentagons (i.e. red, green, blue pentagons are joined by yellow triangle). So far so good. Now that leaves three uncolored triangles at each vertex. If I pick three additional colors (7 total), is there a way to color the triangles so that no vertex has two faces the same color? When I attempt this by randomly picking a color to start, and holding the one-face-of-a-color-per-vertex rule true, I can get about a third of the way around the polyhedron before this fails (i.e. no matter which color I choose, one vertex of the triangle already has a face with that color). Is there a proof that says I need four additional colors? Or am I just missing some strategy that lets me use just three? Trial and error isn't working. Map colouring is a complex and difficult topic. The four-colour theorem, that to always avoid even edges meeting you need four colours, was first proved by a computer exhausting all the possibilities and, I think, more recently proved analytically. The problem you pose is way more complex. I think you would be best advised to develop a four-colour pattern. There are some things you can do to make life easier. 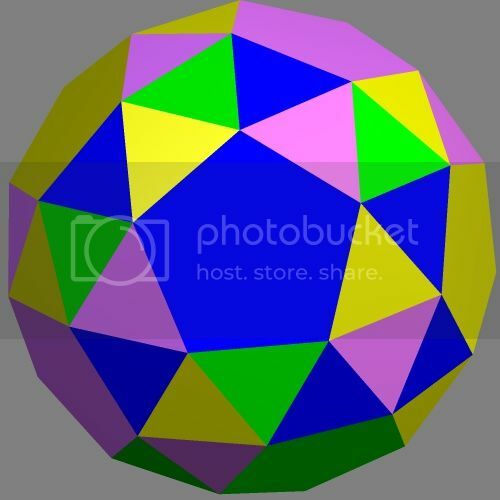 First recognise that the solid is more correctly a snub icosidodecahedron - those first triangles which touch three pentagons are the faces of an icosahedron, just as the pentagons are faces of an icosahedron. The remaining "infill" triangles lie in the face planes of a 60-faced solid, I haven't worked out which. By augmenting the pentagons and icosahedral triangles with shallow pyramids you can blend each slope in with the adjacent infill triangle to create that solid. Then figure a 4-colour (or whatever) scheme for that solid. Thinking about it some more, I was able to do the scheme I wanted with the snub cube, which also has five faces meeting at each vertex. But the difference, I think, is that since the triangles are arranged about square faces (with an even number of edges), I can use an alternating pattern of colors. In this case, arranging around a pentagon (with an odd number of edges), there needs to be three distinct patterns. So I looked at using four colors. But I couldn't reason out a way to use them in any pattern that "fit" the polyhedron. What I mean is, I couldn't pair them up consistently, or array them around pentagons consistently. Then I figured I'd do five colors, and use a consistent pattern of five around each pentagon. Wrong again. I couldn't use the same pattern without violating the no adjacent faces rule. In both of the above attempts, I noticed something else. It looked ugly. Too much random color. My scheme just breaks down with larger numbers of faces. So I decided to violate the vertex rule and allow the same color to touch at the vertex only. With that, it became easy. I just arrayed five triangles of the same color around each pentagon, picking a different triangle color for each pentagon color.